Two routes can be followed to Mungo from Balranald. The first is to travel westwards along Sturt Highway for 20 km and turn north onto Prungle-Mail Road and follow it to the junction of the Mildura-Ivanhoe Road. Continue north on the Mildura-Ivanhoe Road for a further 35 km to the park entrance. The second route is to leave Balranald and follow the Balranald-Ivanhoe Road northwards for 13 km and then turn to the north-west onto Tin Tin-Bidura Road. Pass the mostly-dry Tin Tin Lake and join with Marma Box Creek Road. From that intersection continue westwards for approximately 20 km then turn north onto Torlee-Leaghur Road and follow it northwards for approximately 40 km to the park entrance. The area is isolated and bush camping facilities are available at two sites only. Visitors are asked to bring their own water, food and sufficient fuel for their return journey, at least 300 km. Wet weather can make roads impassable so check with the National Parks Service Office in Buronga. Near the entrance to the park is a woolshed and a Visitor Centre, which outlines the physical and cultural history of the National Park. The Mungo Woolshed is open to the public. It was built in 1869 of Murray pine and serves as a reminder of the important role of the pastoral industry in the recent settlement of this area of western New South Wales. In the 1850s Mungo was part of the larger, Gol Gol Station. During the ice ages it was part of a series of lakes, the Willandra lake system, which drained into the Darling River. Around the eastern shores of these lakes huge sand-dunes once existed consisting of sand and clays, which were progressively deposited on the dunes as the lakes dried up. Today the surrounding country has vegetation such as belah (casuarina) growing on the old dunes, bladder saltbush on the ancient lake bed and mallee in dune areas. To the east of the lake bed are the remains of the sand-dunes called The Walls of China, named after the Chinese workers who constructed the shearing shed on Gol Gol in the late 1860s. These sand-dunes are over 40 m in height and stretch in an arc for approximately 40 km. They have been eroded into fascinating shapes of pillars and gullies and have colours ranging from red-orange, red-brown to cream-yellow. Wildlife abounds. Species ranging from red and western grey kangaroos, echidnas, native mice and bats, lizards and of course a few species of snakes are found. The birdlife is prolific including emus, orange chats, pink cockatoos, falcons and other birds of prey. The Willandra Lakes system dates back to some 50 000 years before present when the lakes were full of water and the sand-dunes developed during a cold, dry and windy climate. As the climate became warmer, around 20 000 years before-present, the lakes began to dry for the last time. Human habitation 40 000 years ago It was in this landscape that the most fascinating and important finds were made; the cremated remains of a woman (of 26 000 years ago), a tall male (estimated to have lived 28 000 to 30 000 years ago) and numerous animal remains. These ranged from Procoptodon goliah an extinct giant short-faced kangaroo standing over 2.5m tall; hairy-nosed wombats and wallabies. The diet of the first human inhabitants included Murray cod, golden perch, shell-fish, emu eggs, wallabies and small marsupials. Archaeological studies uncovered the first known use of ochre in the world, and have enabled further understanding of ancient cultures. It was to ‘Lake Mungo country’ that the burnt, mineral-encrusted remains of ‘Mungo Woman’ were returned early in 1992, to be reburied in ‘her’ lands. It was because of ‘Mungo Woman’, Aboriginal heritage and records of past climate changes preserved in the landscape that Willandra Lakes World Heritage Region was established in 1981. National Park Visitors Centre provides the information needed to understand the region’s natural and cultural history. It is located at the park entrance. There is only one public road within the park. Between the entrance and the Walls of China it is suitable for two-way traffic, but after that, for some 50 km it is one-way only. Camping is permitted within the park only at designated areas near the entrance and at Belah Camp. Picnic facilities are provided at Walls of China, Rosewood, Mallee Stop, Round Tank and Vigors Wells. 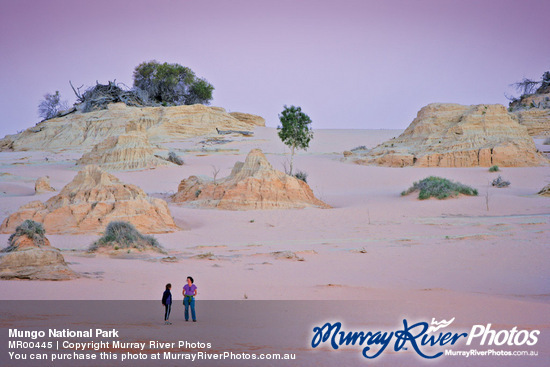 The Walls of China stop provides the visitor with a chance to walk amongst geological history and view from the top of the dunes the vast expanse of Lake Mungo. Early morning is an excellent time to appreciate the landforms and animal life. All animals and Aboriginal artifacts are protected by law, so please do not disturb or remove anything. Walking tracks are provided. 1 km distance, begins at the park entrance. Begins at the entrance and extends along the south-western edge of the lake bed, to the park boundary (approx 9 km one-way). 500 m allows the visitor to enjoy the mallee country. The Drive Tour Distance: 60 km. The signposted track crosses the lake floor to the Walls of China, where a climb to the top provides a spectacular view across the former lake bed. From here the track continues into mallee country, and then around the north-western shore of the lake. Along the track picnic facilities are provided at numerous points. Note that beyond the Walls of China the track is one-way only and all Aboriginal artifacts are protected by law. National Parks and Wildlife Service of NSW and representatives from the Paakantyi, Mutthi Mutthi and Ngiyampaa people jointly manage Mungo National Park. Aboriginals with traditional links to the World Heritage Area are actively involved in Park Management.The Visitor Centre is open every day and located near the entrance of the park, providing a range of information about the park and its natural and cultural heritage. 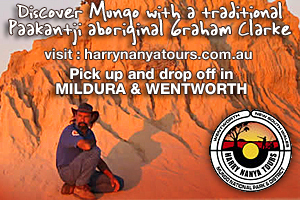 Mungo National Park tours can be taken with Harry Nanya Tours. Day tours from April to October and Sunset Tours from November to March. You can self drive from Mildura, Wentworth, Balranald or south from Broken Hill, however much of the road leading in is dirt. If you're unsure of the region please read our travel tips. From the Murray River region Mungo National Park is approximately 110km north east of Mildura and 130km from Euston or 160km from Wentworth and north west from Balranald. As an alternative route from Broken Hill, Mungo can be reached by travelling the Darling River south from Menindee through Pooncarie or straight south on the Silver City Highway from Broken Hill to Wentworth, if you wish to stay on the sealed road. Please ensure that road conditions are checked prior to travel.